An archivist appraises and researches records and documents to determine their importance and potential value. She then preserves and catalogs these materials so people can access them in the future, ensuring they're not lost and forgotten. Most archivists have expertise in a particular document type, such as manuscripts, photographs, maps, websites, films, and sound recordings. Specialists who work with documents and photographs are referred to as conservators. Some archivists specialize in a specific area of history. An archivist can also provide outreach to the public. She might coordinate facility tours, lectures, classes, and workshops. More than 6,000 people were employed as archivists in 2017. Archives technicians help archivists with locating and preserving artifacts and records. The majority of archivist positions require an undergraduate degree at a minimum, even for entry-level jobs. Education: You will likely need a master's degree in history, art history, library science, or records management. Some schools offer master's degrees specifically in archival science. Coursework in archival techniques is usually required as well. When working in a specific industry or type of collection, you may also need knowledge in that area. A Ph.D. may be required for employment with some colleges and universities. Certification: An archivist can receive voluntary certification from the Academy of Certified Archivists. You'll need a master's degree and at least one year's experience to become a Certified Archivist, and you must pass a written exam. This designation can make you a more marketable job candidate. Internships and performing volunteer work can also be very useful. Analytical skills: You must be able to determine the origin, importance, and condition of materials so you can decide which items to preserve. Organizational skills: Organizational skills are important in developing systems for storing materials and making them available to the public. Interpersonal skills: Your ability to listen, verbally communicate, decipher body language, and instruct people will facilitate your interactions with the public. You might be called upon to work as part of a team. Computer literacy: This includes accessing databases and other electronic document management tools. The job outlook for this occupation is excellent. The U.S. Bureau of Labor Statistics expects employment to grow faster than the average for occupations overall between 2016 and 2026. Approximately 50% of archivists work for museums and historical sites. Another 39% work in informational services. 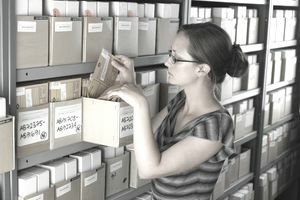 Colleges, universities, and government agencies also employ some archivists. Most archivists work in New York and Maryland, areas where museums and historical sites are relatively plentiful. Archivists who work with the maintenance of records work with NASA, the U.S. Army, the FBI, and the National Archives and Records Administration (NARA). Colleges, universities, and government agencies are known for observing all federal holidays, as well as adhering to a typical business schedule of Monday through Friday. The Society of American Archivists offers a searchable database of learning institutions that offer archival educations. The National Archives and Records Administration accepts volunteers. Sources: Bureau of Labor Statistics, U.S. Department of Labor, Occupational Outlook Handbook; Employment and Training Administration, U.S. Department of Labor, O*NET Online (visited June 13, 2018).